When was the last time you flossed your teeth? Today? Yesterday? Last week? Do you remember? A 2015 survey found that 40 percent of Americans floss every day. That means six in 10 people do not make flossing a part of their daily oral health routine. At Sunrise Dental, we are even more concerned to know that one in five people never floss their teeth. That’s at least 20 percent of the population who are exposing themselves to a serious risk of developing gum disease. When you visit any of our dentist offices in Cary, Chapel Hill, Durham, or Raleigh, we will check your gums as part of your routine visits. If needed, we can treat your periodontal disease without surgery, and we can show what you can do to prevent it from coming back. What Is Periodontal Disease? Periodontal disease, or gum disease, is defined as “an infection of the tissues that surround and support your teeth,” according to mouthhealthy.org, a patient education website created by the American Dental Association. Gum disease develops because of the bacteria that live in your mouth. This is the same bacteria that can cause plaque, tartar, and tooth decay. If you do not remove bacteria or plaque, you run the risk of developing gum disease. In fact, 80 percent of people have some form of gum disease, according to the American Dental Hygienists Association. (Dental hygienists are the people who normally clean your teeth, so they would know.) If there is good news, it’s that many people only have gingivitis, which is a milder form of gum disease. People with gingivitis have symptoms like: ◆ Red, swollen gums ◆ Gums that bleed easily (such as when you are flossing or brushing your teeth) If left untreated, gingivitis can develop into periodontitis, which is a more advanced form of gum disease. 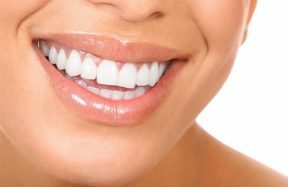 As you might expect, the symptoms of periodontitis are more severe: ◆ Gum recession (gums that pull away from your teeth) ◆ Pocket formations between your teeth and gums ◆ Persistent bad breath ◆ Teeth that feel loose ◆ Changes in your bite When you gums pull away from your teeth, this creates spaces where bacteria can build plaque and tartar. This can damage your gum tissue and the bones that hold your teeth in your mouth, which is why your teeth may start to feel loose. In a worst-case scenario, your teeth can fall out. How We Treat Gum Disease For people with gingivitis, routine cleanings are often enough to treat their symptoms. For periodontitis, we will have to do a little more, however. The first step in treating advanced gum disease is to give you a deep cleaning. This is known a scaling and root planing. This involves removing plaque and tartar formations that are next to the roots of your teeth. Our hygienists use a combination of electronic and manual scaling to scrape the tartar away from your teeth. After that tartar and plaque have been removed, the hygienist will clean the pockets that have formed in your gums. We finish by cleaning stains and brushing away any debris on your teeth. You should be aware that this process can take an hour or two, but it could be the difference between saving your teeth and losing them. How To Prevent Gum Disease Hopefully, you will never need to be treated for advanced gum disease, and you can take steps to prevent it. You probably already know the steps you should follow. First, brush your teeth twice a day for two minutes each time. Be sure to brush your teeth on all sides. Brushing removes a lot of bacteria and plaque buildup that can lead to tooth decay and gum disease. Second, floss every day. Flossing allows you to remove bacteria between your teeth and under your gumline. These are places where your toothbrush can’t reach. If for some reason you can’t or won’t use dental floss, we encourage you to ask us about other interdental cleaning devices, like water picks and flossers. Last, but not least, you should visit Sunrise Dental for routine cleanings and checkups. Your hygienist can remove any plaque or tartar that you may have missed, and we will examine your mouth for signs of gum disease and other problems. Keep Your Gums Healthy You want to keep your teeth, which is why you should care about keeping your gums healthy, too. If you are worried that you may have gum disease, visit any of our dentist offices in Cary, Chapel Hill, Durham, or Raleigh. Call any of our locations at the numbers listed here or use our online form to make an appointment at the location closest to you.